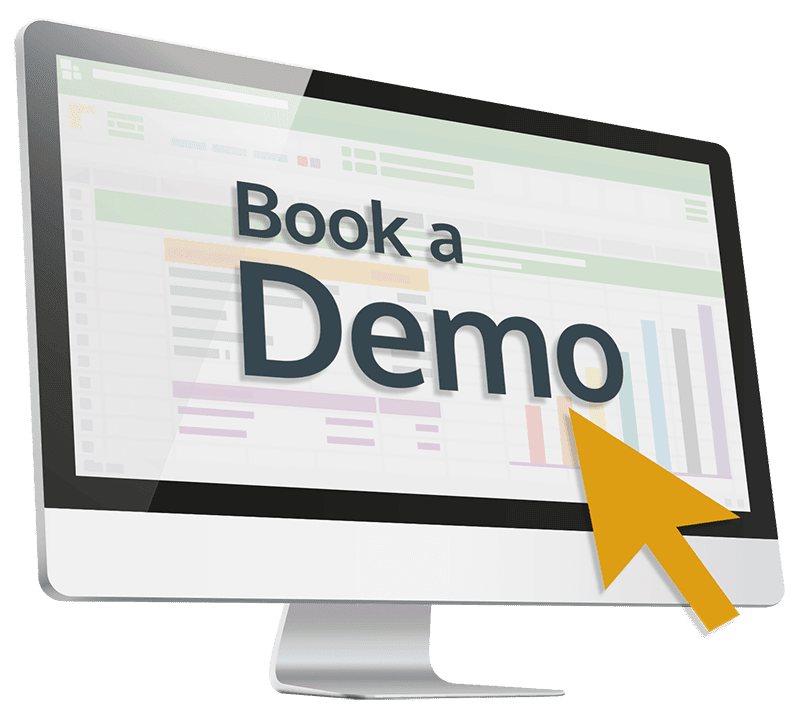 Our Customer Relationship Management system is your single portal for matching candidates to vacancies, controlling applications, managing interviews, making offers and advertising roles. As a small recruitment company, any time spent with long-winded data input tasks is time wasted. This is why we have incorporated the most efficient CV parsing tools into our system. Simply drag and drop CV documents within Outlook and we use ‘Burning Glass’ technology to immediately create candidate records, populating key information; contact details, name and attaching the CV. 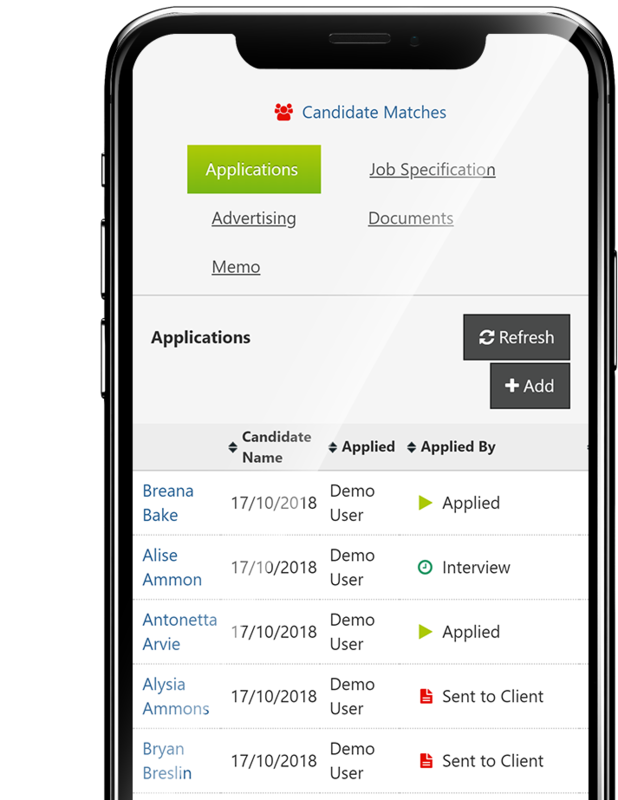 Manage your candidates through the Recruitment process with optional automatically generated emails, ready to send out for Terms of Business, Interviews and relevant Contracts. Giving you a window into all vacancy activity and a compliant paper trial. We have developed a matching system to provide a useful, instant list of suitable candidates. A powerful algorithm assesses criteria such as buzzwords, groups, location and recent contact to calculate a percentage match and list most suitable candidates for a vacancy. Your Secure, Real-time data is accessible on any device — all you need is internet connection. Automatic generation of Emails, including TOBs, Interview letters & Contracts. Both In & Outbound Client / Candidate emails are automatically recorded. Broadcast new vacancies, updates, news and even send top CVs within minutes. 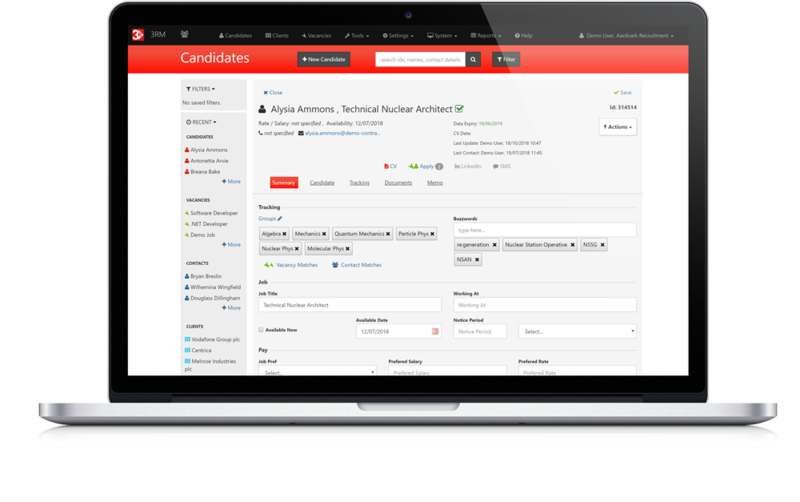 Manage your candidates through the process with optional automatic emails and a compliant paper trial. 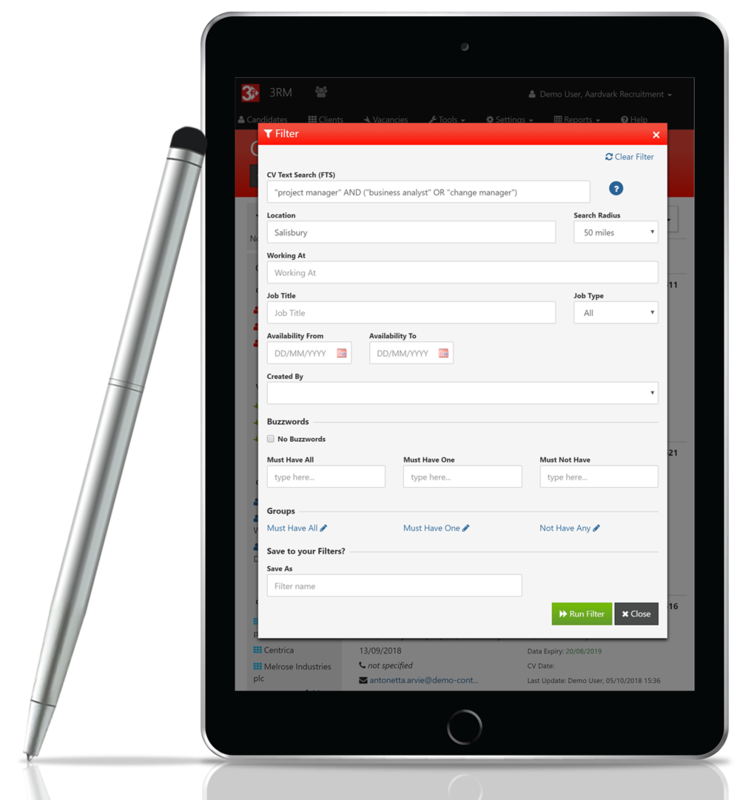 Automatically populate relevant legal contracts — Umbrella, LTD contractor, PAYE etc., to protect all parties. Let us populate your contacts, from LinkedIn or other sources, quickly and efficiently. Reporting tools are available to help you to efficiently monitor and manage your and your team's time. Set important call-backs, tasks and see vacancy updates automatically in your Office Calendar. You can count on support from your dedicated Account Manager and Helpdesk team. As our Development Team are in-house they are always working on new integrations and upgrades. Often these come from our users!